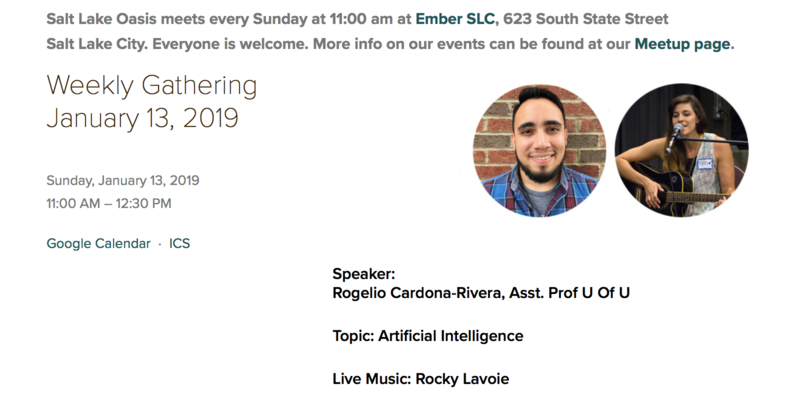 Rogelio E. Cardona-Rivera, QED Lab Director and Assistant Professor of Computing and Entertainment Arts and Engineering at the University of Utah, presented an invited talk at the Salt Lake Oasis Weekly Gathering, celebrated in Salt Lake City, UT, USA. Salt Lake Oasis is a secular community for people looking for a dogma-free social network and friendship. We started in 2016 and are part of the Oasis Network.